If you live in a city, the ice cream trucks from 9 – 9 and extra gunshots are some other helpful clues. Summer’s here! This summer is the first in awhile where my husband isn’t studying for the CFA exam or taking graduate school classes, so we decided to really do it up big time. So big that we made a list. Many things on the list are NYC-based: METS game, Brooklyn Cyclones game, Coney Island, outdoor concerts, picnics, circus, hot dog festival. But many simply aren’t attainable in the city: swim in a pond, visit a dairy farm, visit a berry farm, go camping, swim in a lake, go fishing, beach, beach, beach and maybe try to get to a beach. I grew up on the beach. Being at the beach with my family is basically the best part of my year. It may have made the list a few times because of this. In any event, many activities on our list require us to travel. To be fair, we go away about 1-2 weekends a month for most of the year in order to visit with all of the grandparents anyway. But when summer rolls around, that average increases greatly. I mean, two sets of grandparents have homes on the beach. Free beach vacation with free partial child care (most mornings and at least one date night per visit seem to be the unspoken terms)? Hello?! I’m in! Sometimes I catch some flak from friends about how often we are away. Mostly it is someone asking what we are doing that weekend and when I say where we are going they simply say, “You guys are always out of town!” There is a very clear tone included in this statement. As though we are hurting someone. We get to sleep in until 8 am and our kids are having ice cream by lunchtime so I can’t figure out what’s so bad. The tone kind of annoys me, to be honest. It is two thousand degrees here and let me tell you, dog poop, vagrant piss and college kid vomit don’t smell better with the heat. Whoever told you that lied straight to your face. Why wouldn’t we try to get out of the city during the summer as much as possible? First of all, I am officially convinced that peeing in bottles is not a ‘last resort emergency tactic,’ as I was made to believe for many years. Now that his sons are getting older he seems to do it with much greater frequency. And after Carlitos did it for the first time a few weeks ago? Forget about it. My husband filled up THREE bottles on our last drive. Clearly, this has become some sort of male-bonding ‘pee pee fun time’ business. 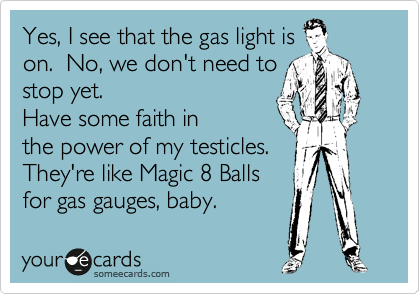 Second of all, I have concluded that along with the (very scientific) connection between uteri and locator abilities, there is a (very scientific) connection between testicles and the gas gauge. To be more specific, my husband seems to have some insatiable urge to discover exactly how many miles our car can continue driving once the gas light has turned on. I still recall this happening ten years ago when we lived in Colorado. We went on a road trip and the gas light turned on while we were in the middle of random mountains somewhere (geography isn’t my strong suit) and we had to keep switching the car into neutral every time we were going downhill in order to save gas. If I remember correctly, we went an additional 30 miles after the light went on. I was terrified the whole time, thinking we were going to be stuck in the absolute middle of nowhere and get eaten by bears. Or hungry mountain folk. Now I can see so clearly that this must have been his moment of glory. He got the car to actually keep driving for the exact same number of miles it said it should in the manual! Is that some sort of male Holy Grail? Like, equal to if I actually chipped away 2 pounds a week starting in February and was bikini-ready by June 1st exactly as Weight Watchers told me I could do? Ever since that day, we argue any time the gas light comes on. I want to stop and get gas. He wants to keep driving ‘a few’ more miles. Maybe just until ‘the next exit.’ Fifteen miles later I am hyperventilating and he is telling me how he would never put our family in danger. Dang it. He knows those are, well, the opposite of fightin’ words. Those are the words that make me stop arguing and let him have his Big Daddy Protector Bear moment. Well, it is partially me letting him have his moment and partially that I noticed that this rest stop doesn’t even have TCBY anyway. Sure, love! Keep driving! I support your decision! You are welcome to join us on any of our excursions, by the way. You have to have about 25 inch hips in order to fit in between the two car seats, but other than that there are no requirements. Oh, also, you can’t be a total a-hole. Partial a-holes are okay since my husband and I are already in the car anyway, but total a-holes can really ruin a road trip. Although I do urge you to bring your own beverages, and never steal a swig of anything that looks like delicious lemonade while in our car. And I wouldn’t hate ya if you smuggled in a small gas can without my husband noticing. This entry was posted in Real: my personal trials, tribulations and tales and tagged city heat, family car trips, gas light on, peeing in bottles, road trips, summer. Bookmark the permalink. Follow any comments here with the RSS feed for this post. Post a comment or leave a trackback: Trackback URL. First, a near empty tank puts extra stress on the fuel pump. Driving like your Husband with Big Ones will shorten the life of the fuel pump. So says Click and Clack of Car Talk. Secondly, the bottom of the fuel tank contains sediment and other non-combustible junk that will eventually clog either the fuel filter and/or bugger up the fuel injectors. One can buy a small market TCBY franchise with the money saved by not having to replace fuel pumps and fuel injectors on your SUV. However, regarding the bottles one might keep under the fronr seat, I agree. It should be “standard issue” for any road trip to keep a couple empty jars with tight-fitting lids near by so as to “make time” while on the road. THANK YOU! Having technical information (from Click and Clack, no less!) about damaging our car will surely let me win this one! We’ve been going every weekend to Jacob Riis Park in Queens. You would be SHOCKED how nice the beach is, and its like 5 miles away to boot, so feel free to drive there with your gas light on! I think we have a free weekend around town in July of 2014, so let’s meet up there then, okay?!? In all seriousness, let’s try to do a day trip there during the week perhaps???? ?